On Friday, Township Council authorized the use of dedicated Township Open Space funds toward the preservation of the Woodcrest Country Club property as open space. Council and I, in partnership with the Camden County Freeholders, are committed to doing what we can to ensure that this 155 acres of open land be kept green and protected from development, for the benefit of the entire community. Read more about our commitment to preserving this property by clicking here. The Township Engineering Department will begin road work on Cambridge Road between Brighton Road and Kingston Drive, weather-permitting, on Monday, May 20. These important infrastructure upgrades are part of the Township's ongoing Road Maintenance Program. For more information, please contact the Engineering Department at (856) 424-3203. Please join Township Council and I for Cherry Hill's annual Memorial Day ceremony, 11 a.m. Monday, May 27, at the Municipal Complex. 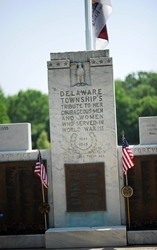 In addition to our traditional tribute, this year’s event will include the rededication of the Township’s War Memorial, to include the names of three Cherry Hill natives killed in combat in the wars in Iraq and Afghanistan: Lt. Col. John Spahr and Capt. Gregory Dalessio, who were killed in Iraq in 2005 and 2008, and Lance Cpl. Jeremy Kane, who was killed in Afghanistan in 2010. The event will feature remarks by Col. Jeffrey Doll, commander at Fort Dix, as well as a musical tribute to our Armed Forces by the Cherry Hill Pine Barons Chorus. Afterwards, please join us for a free barbecue lunch courtesy of ShopRite Supermarkets of Cherry Hill. We are proud to partner with American Legion Post 372, Jewish War Veterans Furer-Barag-Wolf Post 126 to present this day of remembrance. For more information, please contact the Cherry Hill Recreation Department at (856) 488-7868. History buffs will enjoy attending free presentations by the Archaeological Society of New Jersey, from 11 a.m. to 2:45 p.m. tomorrow in the Croft Farm Arts Center. The day will feature several sessions, including a prehistoric look at early Camden County, and a special presentation on the archaeology of our historic Croft Farm. History buffs and novices alike are certain to find this special event fascinating, and we're grateful to the Archaeological Society for choosing Cherry Hill for this special event. More than 100 people turned out for a lecture by the Society's president, Cherry Hill native Dr. Ilene Grossman-Bailey this past Tuesday night. What lies beneath can give us a greater understanding of our heritage - from the Native Americans who inhabited this area for thousands of years, to the farmers and others who lived here before our suburban development. For more information, including a full list of tomorrow's sessions, click here. 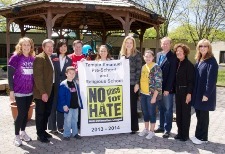 Earlier this month, Council President Dave Fleisher and Councilwoman Susan Shin Angulo helped the Temple Emanuel community celebrate its designation as the first congregation in the tri-county area to be named "No Place for Hate" by the Anti-Defamation League. This is something Rabbi David and his congregation have worked on for more than a year, and we are proud of the example Temple Emanuel has set. There is absolutely no place for bullying and bigotry here in Cherry Hill; all people, no matter who they are, how they look, or what they believe, deserve the same love, kindness and respect that we all want to be shown. Registration is going on now for all summer programs offered through the Recreation Department, including our summer baseball league, sports camps, and the extremely popular Morning Fun Summer Camp. Information on all classes and programs is available in the Summer 2013 Community Magazine, which was mailed to homes earlier this month. If you have not yet received a copy of the magazine, view a PDF version or register online by clicking here. For more information, please call (856) 488-7868 or email Recreation@CHTownship.com. The Cherry Hill Police Department reminds drivers and passengers to buckle their seatbelts whenever they’re in the car this summer, and all year long. From May 20 to June 2, local police will take part in the 2013 “Click it or Ticket” enforcement campaign, aimed at promoting seatbelt use. Seatbelts save thousands of lives every year across America – and enforcement efforts like this one help promote their use among both drivers and their passengers. Please abide by the law and buckle up next time you’re behind the wheel, and remind your loved ones to do the same. 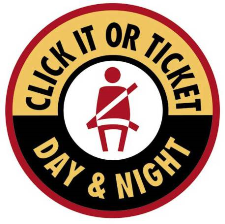 For more information on the “Click it or Ticket” campaign, click here. More than 100 men, women and children turned out at Challenge Grove Park last Saturday to raise awareness about preeclampsia and HELLP syndrome, severe and often life-threatening complications of pregnancy that are frighteningly common. 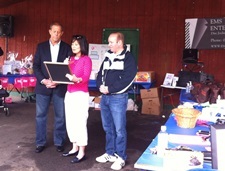 Council President Dave Fleisher and Councilwoman Susan Shin Angulo joined me to deliver a special proclamation at the beginning of the walk. The Promise Walk for Preeclampsia aims to educate the public about the symptoms of these conditions and raise money for research to help save the lives of future generations of women and their babies. This year's walk in Cherry Hill raised nearly $30,000. For more information, click here. On Friday, Township Council met to authorize the use of dedicated Township Open Space funds toward the preservation of the Woodcrest Country Club property as open space. Council and I, in partnership with the Camden County Freeholders, are committed to doing what we can to ensure that this 155 acres of open land be kept green and protected from development, for the benefit of the entire community. The Country Club will be sold at auction May 20. Read more about our commitment to preserving this property in a letter Council President Fleisher and I sent to Woodcrest residents several weeks ago by clicking here [http://www.cherryhill-nj.com/CivicAlerts.aspx?AID=229] . More than 100 people turned out for a lecture by the Society's president, Cherry Hill native Dr. Ilene Grossman-Bailey this past Tuesday night. What lies beneath can give us a greater understanding of our heritage - from the Native Americans who inhabited this area for thousands of years, to the farmers and others who lived here before our suburban development. For more information, including a full list of tomorrow's sessions, click here [http://www.cherryhill-nj.com/Calendar.aspx?EID=658&month=5&year=2013&day=17&calType=0] . Registration is going on now for all summer programs offered through the Recreation Department, including our summer baseball league, sports camps, and the extremely popular Morning Fun Summer Camp. Information on all classes and programs is available in the Summer 2013 Community Magazine, which was mailed to homes earlier this month. If you have not yet received a copy of the magazine, view a PDF version or register online by clicking here [http://www.cherryhill-nj.com/index.aspx?nid=127] . For more information, please call (856) 488-7868 or email Recreation@CHTownship.com [mailto:Recreation@CHTownship.com] . The Cherry Hill Police Department [http://www.facebook.com/#!/pages/Cherry-Hill-Police/102651889791363?fref=ts] reminds drivers and passengers to buckle their seatbelts whenever they’re in the car this summer, and all year long. From May 20 to June 2, local police will take part in the 2013 “Click it or Ticket” enforcement campaign, aimed at promoting seatbelt use. Seatbelts save thousands of lives every year across America – and enforcement efforts like this one help promote their use among both drivers and their passengers. Please abide by the law and buckle up next time you’re behind the wheel, and remind your loved ones to do the same. For more information on the “Click it or Ticket” campaign, click here [http://www.state.nj.us/oag/hts/clickitorticket.html] . More than 100 men, women and children turned out at Challenge Grove Park last Saturday to raise awareness about preeclampsia and HELLP syndrome, severe and often life-threatening complications of pregnancy that are frighteningly common. Council President Dave Fleisher and Councilwoman Susan Shin Angulo joined me to deliver a special proclamation at the beginning of the walk. The Promise Walk for Preeclampsia, which has taken place nationally for the last eight years, aims to educate the public about the symptoms of these conditions, and raise money for research, to help save the lives of future generations of women and their babies. Prenatal education and awareness of the symptoms (which include high blood pressure, sudden swelling of face and hands, abdominal pain, blurred vision, headaches and labored breathing) are needed to help reduce maternal and infant illness and even death. Thank you to all those who organized and participated in this year's Walk, which raised nearly $30,000 for the Preeclampsia Foundation. For more information, click here [http://www.promisewalk.org/pfpw/fundevent.asp?vname=philadelphia] .